Christmas was always going to be different in Bhutan. 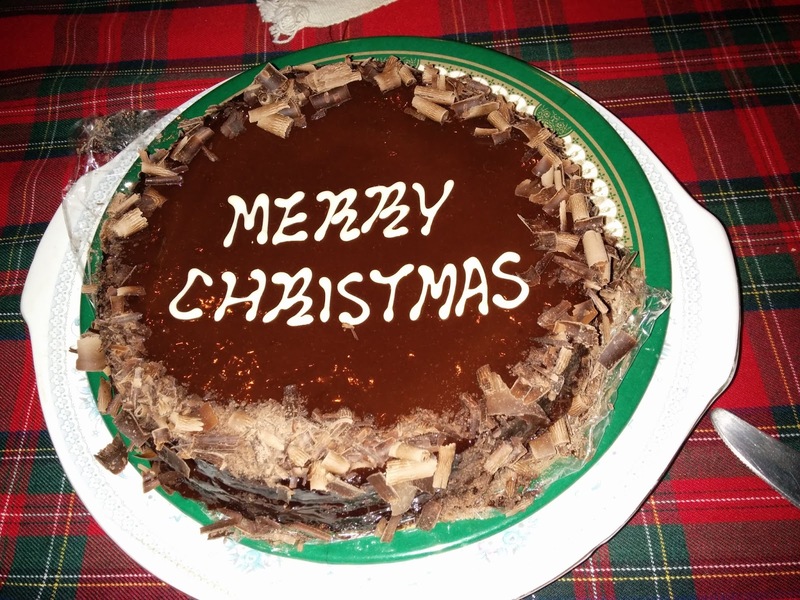 I had hoped that I might be able to get either Christmas lunch or dinner with roast chicken, roast potatoes and Christmas pudding. 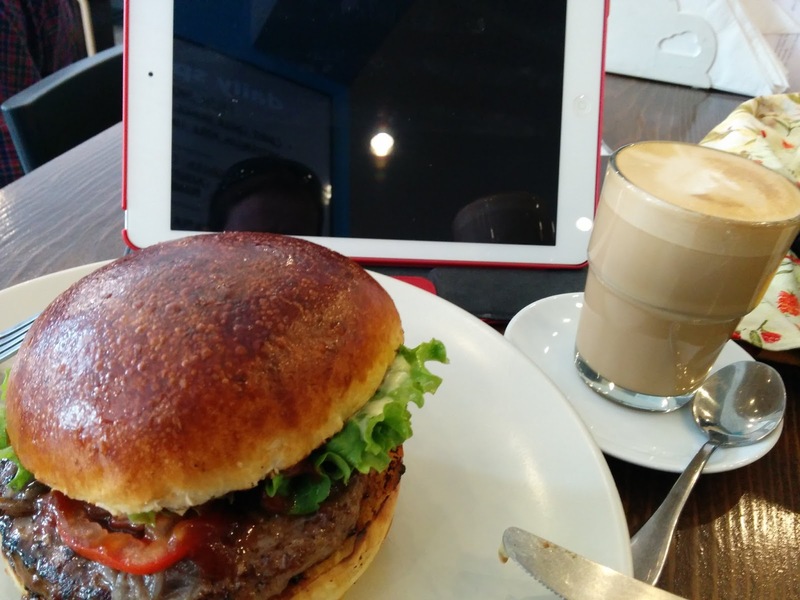 The prospect of booking to eat buffet food at $50 per head at one of the more expensive hotels was not really cutting it for me, so I decided to wait and see what might eventuate. A wonderful invitation to Christmas Eve dinner at Nancy's house provided the company of new and old friends and ROAST CHICKEN along with many other delicacies. 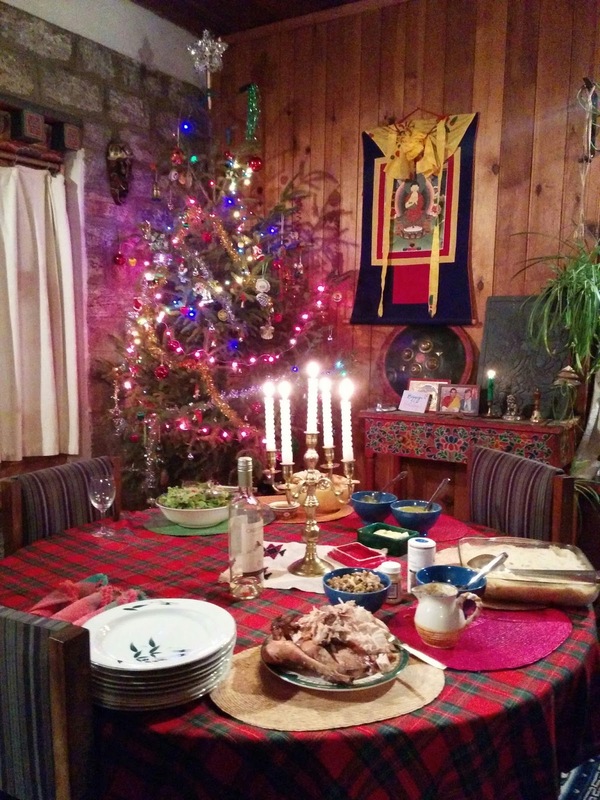 Nancy's royal gift of a Christmas turkey had arrived a bit late to cook for that evening, but after I had officiated with a carving knife, the chicken was much enjoyed. I had decided that watching the full moon rise from BuddhaPoint would be a great thing to do and Scott joined me for this excursion. We left the town around 3:30pm to make the hour and a half (or so) hike uphill to Buddha. 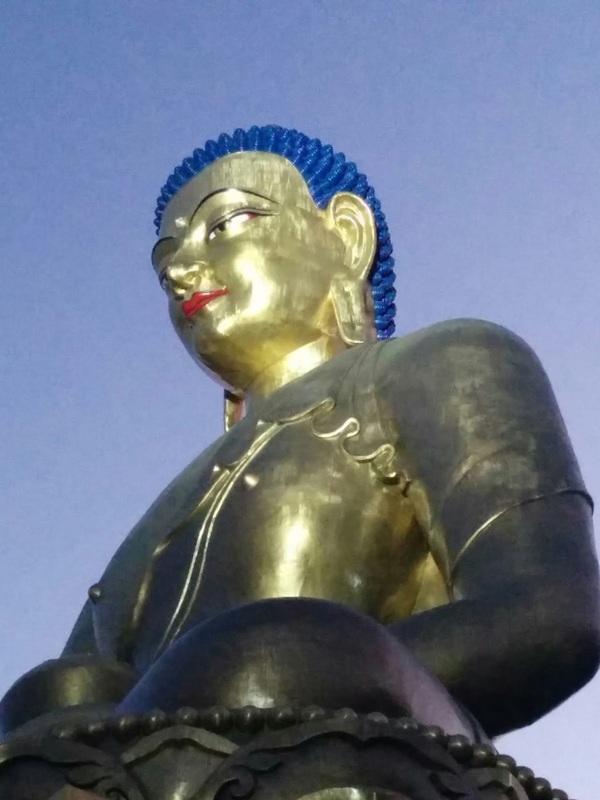 The view from there is wonderful and the enormous statue of Buddha is very special. It was freezing while we waited for moonrise but the top of me was at least snugly warm in merino, fleece and down on top of my normal clothing, and I did not regret one cent of the cost of my fur lined leather gloves. Moonrise was, of course, later than scheduled (I could trivially blame BST - Bhutan stretchable time) as the hills obscured our view of it. When the moon finally rose above the hills it was rather spectacular and sitting in the sky behind the statues which surround Buddha, it made a picturesque scene which was not easily captured on camera. While we were admiring this scene, Scott received a phone call from Ian and Vicky re joining them for Christmas dinner later. I had briefly met Ian a few days earlier and it is characteristic of the generosity and hospitality which infuses this country that I was invited to also join them. A ride down with a couple (he'd been showing his neighbour his new car ... In the dark at one of Thimphu's favourite dating spots...) kindly took us all the way to our destination and Vicky's delicious vegetarian dishes and CHRISTMAS CAKE! To say nothing of their excellent company. Christmas Day was duly toasted with some good wine and by the time I returned to my hotel, I was thoroughly tired but satisfied with my day. 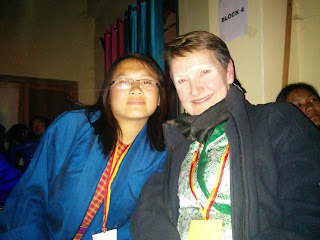 Nancy’s invitation to attend Losar (Bhutanese New Year) celebrations at Ugyen Chholing in Tang was too good an opportunity to pass up. The added incentive of Laura, the new BCF teacher at Tang Central School, being happy for me to stay with her during this time and for a few days after was a real bonus. 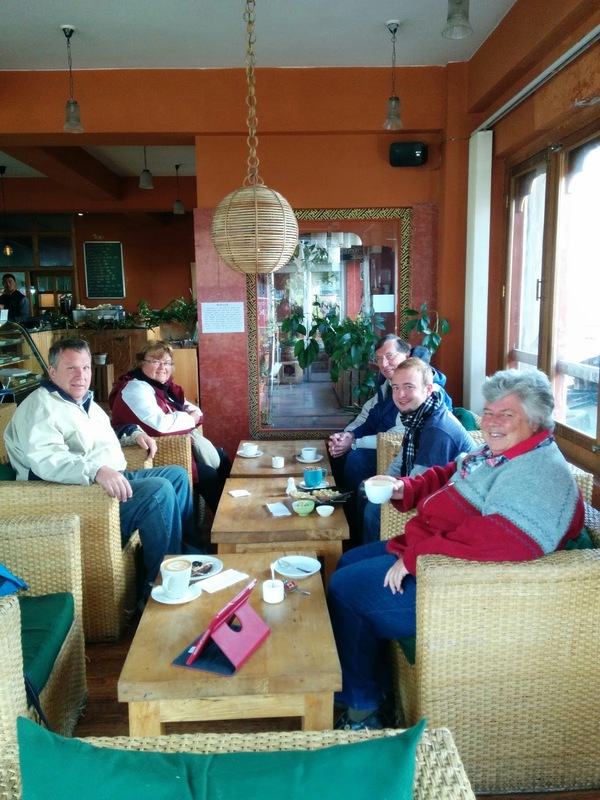 I had met Nancy’s ex-student, Dorji, at Christmas and he was the person to talk to about organisation of the travel itinerary for Nancy’s visitors. I was able to travel on the coach intended for Nancy’s visitors on their journey from Bumthang to the East; they were flying to Bumthang so the coach was loaded with supplies, luggage and had a number of spare seats: so Laura and I were to travel on this coach and were joined by returning BCF teacher Becky, who is placed in Bumthang. The evening before Losar was also Laura’s first night in her house, so we were joined by Becky, BCF teacher from Bidung, Kirsten (who was also on her way to report to school for the beginning of term), Nima (Nancy’s driver) and another Dorji who was the coach driver for housewarming celebrations and a shared meal, whipped up by Nima and me. There was much excitement later in the evening as some went outside and discovered it was snowing and settling. The snow impacted on our water supply (frozen pipes), so my shower turned into a very quick mandi bath, but the delight of waking to a snow covered landscape was wonderful. The pine trees had their branches weighted down with snow and the fields and roofs had an inch or so of snow. I had turned the water boiler (urn) ready to make coffeee when there was a knock on the door with Nima there, hoping we had electricity (his room did not) and the ability to make his early morning coffee. I have been in Bhutan long enough not to be phased by visitors before 7am. We broke out the packet of ground coffee beans brought from Thimphu and the coffee plunger (French Press) I had passed on to Laura and were enjoying our first sips of this rare delight when another knock on the door brought Tshering, the caretaker’s son, with a tray of rice porridge (with chilli of course) – the traditional holiday pre-breakfast treat – and changkhey, the freshly fermented rice drink to which egg had been added. 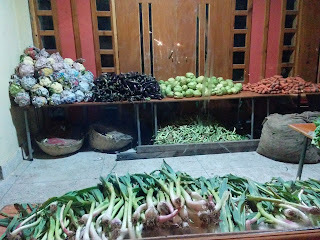 Nima declined to participate in these delicacies, as some was also being delivered for him and Dorji downstairs in their own room. 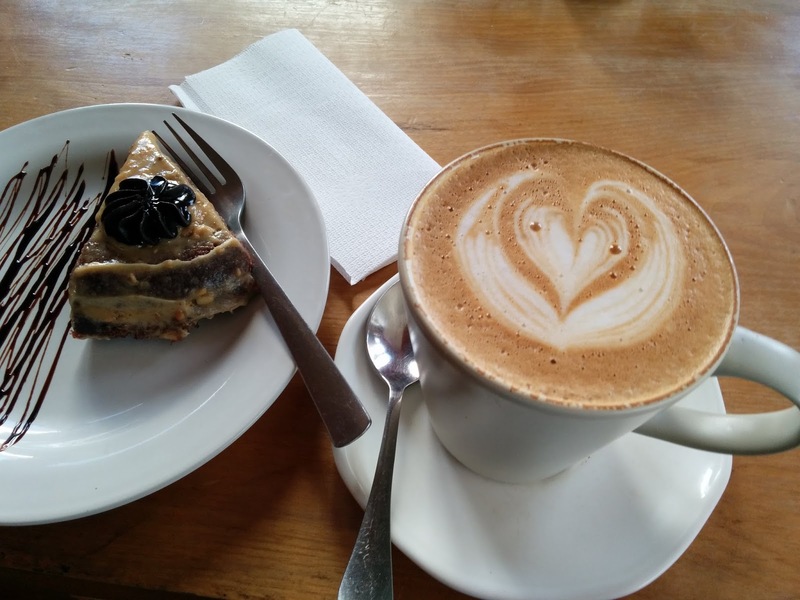 Laura tasted the changkhey, but I chose not to – I have had this before and it is not my favourite drink, besides, I’m not that keen on alcohol for breakfast. Despite Nima’s attempts to get us to depart at his preferred time, many were operating on BST and we eventually departed at 8:30am for the drive up to Ugyen Chholing. Fabulous vistas of snow covered countryside delighted us on our journey. Our arrival at 9am included a short drive through the village road, which had been turned into an archery range for the day. 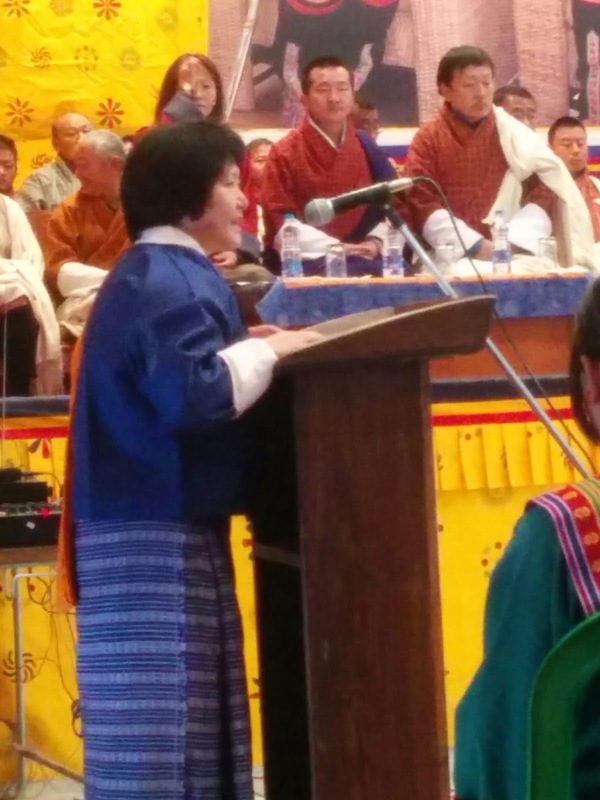 No Losar would be complete without Bhutan’s national sports, archery and khuru (darts). I suspect the use of the village street for the archery range was a matter of convenience, it being relatively the flattest area available. 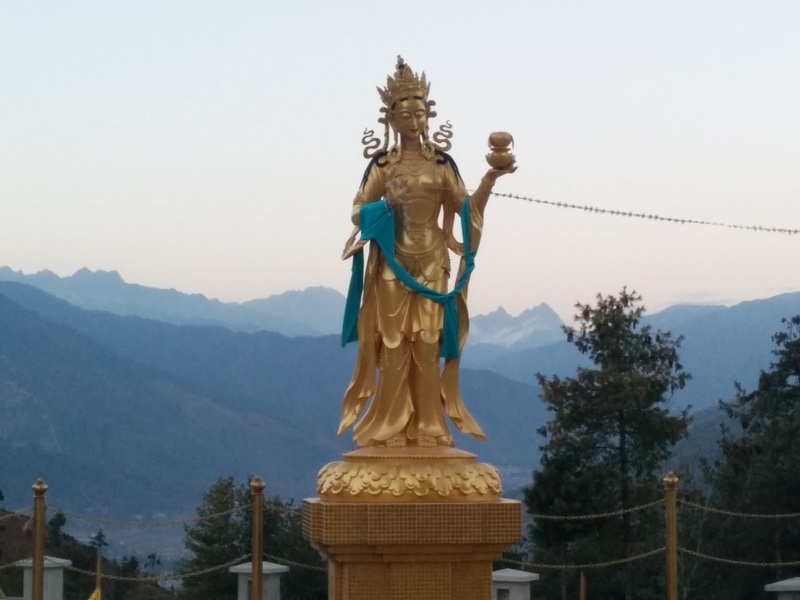 I also saw, on the way to and from Ugyen Chholing, other archery ranges that went across several fences. The Ogyen Chholing palace is a family home, with its own private lhakhang, dating from the sixteenth century, and current owner Kuenzang Choden is about 19th generation. Coffee and chat with Nancy’s visitors, and extra breakfast of toast and honey, was available while we waited for someone who was walking up the hill for prayers and rituals at the lhakang. Finally it was time, and I discarded my down jacket, which I had donned over my kira and taego (though I will confess to a full set of thermal underwear, a warm skivvy and warm hiking socks as my base layers), and we proceeded to the lhakang. I no longer feel comfortable entering a lhakhang and not doing my 3 prostrations in each directions, and I think this and my kira (hand woven) earned me the comments from the elderly ladies after the rituals. Prayers read by the gentleman seated cross-legged beside me were followed by the offerings of bottles of ara to the honored guests and the ritual offering of a bowl of ara. Suja (butter tea) and spiced rice were distributed to all, followed by assorted foodstuffs ranging from fruit and sticks of sugarcane to handmade rice cakes and dough cookies to wrapped sweet food bars. And doma. I gave my doma with my neigbour in prayers, noted that our hostesses husband Walter later did likewise and subsequently mentioned this to other visitors who were happy to donate theirs to other elderly village people present. A number of enterprising younger village ladies had brought their weaving for sale to visitors, though I’m not sure that their efforts were at all rewarded. The cry of “shopping, shopping” came when I looked at their wares, but their scarves were not as nice as those I had asked my Kheni neighbour Sithar to weave, so I was able to resist. There was some time to fill, so a diversion to observe the archery provided the usual amusement that an archery match does. There were separate divisions for those who chose to use the traditional bows and those who chose to use the modern, factory produced cross bows. Either way, the banter and cheering, singing and dancing for successful shots were the same. By then, mid morning, most of the snow had melted and the sun was out, although the wind was cold. 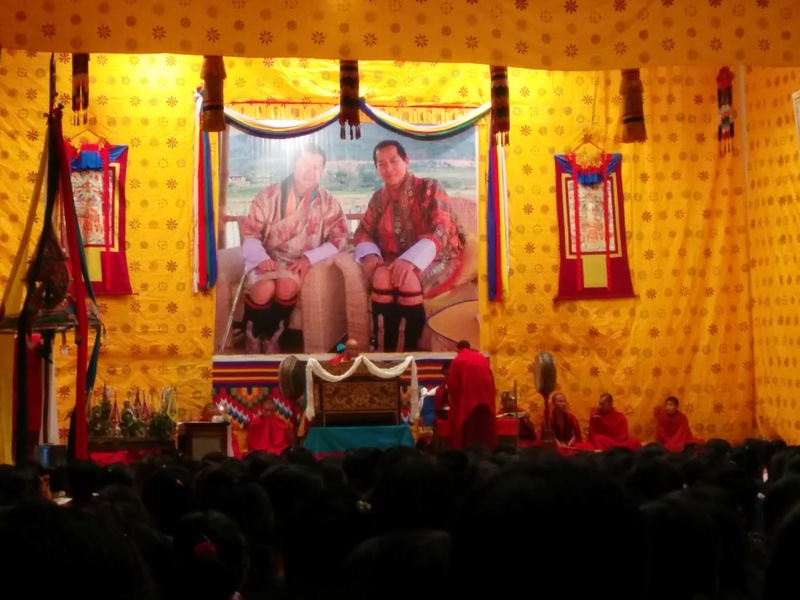 A book launch followed, for the owner of Ogyen Chholing Palace, Kuenzang Choden’s, is also an author. 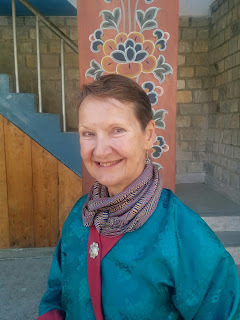 Her new book Guru Rinpoche is coming is a picture story book. It seemed that the real guests of honour for this occasion were Kuenzang’s local reading group – around 20 children from the village, aged from around 2 (she went to sleep during proceedings) to 13-14 years old. There was an invitation to visit the museum; the central tower or utse has been converted into a museum. 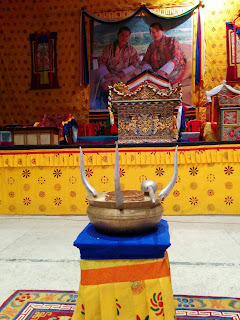 Its contents are largely what had been in the family for the generations that preceded current owner, Kuenzang and the interpretive labels and explanations are interesting and informative –much better than the folk museum in Thimphu. Although I had visited the museum before, in 2013, the prospect of a tour with Kuenzang interested me greatly. Lunch was al-fresco, an interesting choice given that we were at almost 3000m of altitude and it had snowed the previous night. However, there was probably no other suitable space for the number of people as the party seated at table numbered around 20 and there were a similar or greater number of villagers – one invited from each household, seated separately. After lunch a small group of village ladies got up to dance, and were gradually joined by a few more, and then visitors. Great fun was had by all up to and including the final and traditional farewell dance. Farewells were said and Nima drove Laura and I back to Laura’s house. Becky and Kirstan had elected to walk but Laura and I, dressed in Kira, were less suitably attired for such activities. On the drive back a pair of black necked cranes were spotted by Nima and we stopped for photographs, with great excitement. These birds are endangered species and their known wintering grounds are Phobjikah Valley and Bomdeling Wildlife Sanctuary. They had been reported close to Yangtse town in Trashiyangtse and also around Chamkhar. One can only hope that the presence of this pair is indication that the species is increasing in number and geographic distribution. Back at Laura’s new house we engaged in some domestic activities and caught up with Becky and Kirsten who told us they had seen the cranes the previous day. My overall impression of this very intense 3 weeks as a volunteer English teacher at the Winter Youth Engagement Camp (for disadvantaged girls) would have to be WOW! Nothing that happened through the 3 weeks was small and ordinary. I left the camp feeling very rewarded, very appreciated and with an extended family, to say nothing of better relationships with some of my Kheni students, and new friends. I was also very exhausted. With 678 girls, a small army of senior student (upper secondary and tertiary) volunteers, counselors, cooks, those who would run the youth development activities and the clubs and 16 teachers of English, it was a major exercise in logistics. Important visitors at various times added a further logistical challenge. 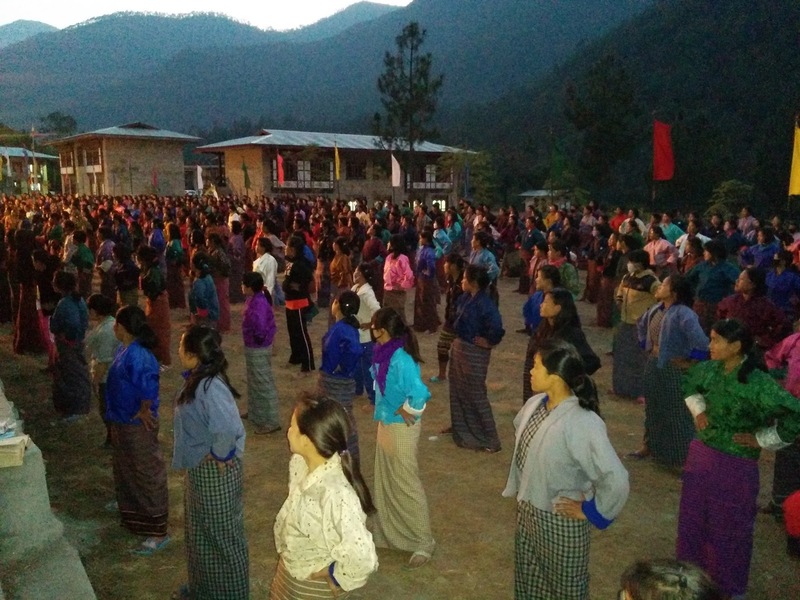 The arrival of the girls on 28th December was staggered – travel times varied from almost nothing for the local girls who were attending the camp to 14 or more hours for those coming from Samdrup Jonkhar. Those I saw arriving were in the standard yellow school buses. I was monitoring the whereabouts of the Kheni girls, who were bringing some of my luggage, expecting them about 4-5 pm based on their anticipated departure time and my ongoing attempts at communication with the accompanying teacher; they finally arrived around dinner time but the bus was stuck at the school entrance – luggage stacked too high on the bus roof to get through the ceremonial gate that had been constructed because of the imminent arrival of a government minister to open the camp. I went with someone in a minivan to watch the unstacking of some of the offending items off the roof (and to make sure nothing of mine got left by the wayside) and then greeted the girls as they were unloading the bus properly at the designated spot, claiming and supervising the unloading of my bags. The girls’ luggage consisted not only of their clothes and toiletries, but also their eating utensils and their bedding – quilts or blankets, and mattresses or carpets on which to sleep. The girls were accommodated in the school dormitories – as a boarding school Gyleposhing HSS has around 650-700 boarders, so the facilities were there (ie, the rooms with bunk bed frames) and the cooks were used to preparing food for that many students in the gigantic cooking pots: 27Kg rice per meal I think was the stated required quantity. Had they been feeding boys, it would have been more. Of course, it was rice for every meal. 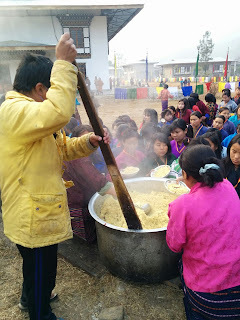 For most, the food was a lot better than boarders’ food in their own schools – many more vegetables they (and I) were accustomed to and meat served at least once per day, although some of them were craving their basic diet of rice and potato curry by the end of the camp. Cooking was done over open fires in the kitchen area – which was a corrugated iron shed and enclosure located about 50 metres from the multipurpose hall. Gyelposhing Higher Secondary School sits on 2 relatively flat plains (upper campus and lower campus) alongside the Kuri Chhu (river) and is surrounded by steep rocky hills sparsely vegetated with pine trees. January, well into the dry season, results in a lot of dead grass, flowers and dust. The school buildings are traditionally styled and of the uniform design that seems to be common to schools throughout the kingdom. 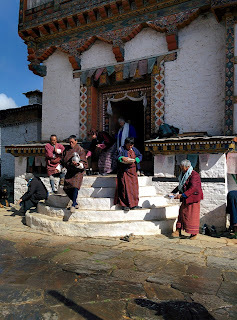 Gyelposhing is also very low altitude for Bhutan: I think around 500m above sea level. It is chosen for the camp partly because the place is not cold in winter and also, I think, because of its proximity to the Gyeltshab’s palace and offices. The early morning temperature was milder at the guest house than at school, and there was a little relocation of standing positions for staff for morning assembly – the sun rising over the hills provided much needed warmth. By midday, sitting in the sun was uncomfortable, but an afternoon breeze cooled us down and the temperature dropped quickly as the sun went down. One disadvantage of the warmer climate was the insects. I am not sure what was biting me, but an enormous amount of swelling, infection and general feelings of unwellness got a bit tedious after the 5th bite. I became paranoid about sitting on the grass with the girls, which was a shame, as this was an opportunity to talk with them in a less formal situation. My supply from home of antibiotics for skin infections got used up and a visit to the doctor at the BHU provided further supplies along with an assortment of other medications. I had been led to believe that the English teaching at camp would be relatively informal, but the first meeting of English teachers put paid to that assumption. There would be a common program, which had pretty well already been worked out, for the class 7-8-9 group for which I had volunteered. We would teach grammar, letter writing, essay writing…. I managed to get some additional ideas into the program, including some self - introductory activities right at the start, and a couple of other activities which were not so much like the standard classroom curriculum. We were told that we needed to work on some program items for “shows” for visitors; I assumed that this was either one item per section or one item per teacher and suggested I could do an Australian song. It turned out that it was one item for the whole of 7-8-9 and I had got it. Practice would be whenever I could fit it into the busy schedule – probably during the lunch break, which, fortunately, was 1.5 hours. Teachers were to identify 2 girls for each section. I asked for volunteers once my classes started, and got 6 volunteers from one class but was struggling to find 2 from the other. It was just as well that I accepted the 6, they formed the core of those who turned up for practice. There should have been around 26, but apart from the first day, most did not come to practice and when we finally performed I am Australian, only about a dozen participated. The performance was included in the closing ceremony – at very short notice, and I was pleased to get compliments from visiting dignitaries, both political and royal, about the relevance of the message of unity. Girls were not forbidden to visit the town, but they had to request permission first, and many were reluctant to approach those in charge to do this. Towards the end of the camp, an afternoon was given over to a walk in the town and almost 700 girls descended on this small town. What started off as a little photography for my Kheni girls, expanded enormously. Requests to “snap photos” and have them printed became more than frequent, and the discovery that I could get the on-site “shop” to print them overnight was very handy, until the supply of photographic paper was exhausted. Preparations for important visitors always took much time. There was practice of the prayers, practice of standing and sitting (without scraping of chairs) at the appropriate times, decoration of the multipurpose hall, erecting of the ceremonial tents, erection of flags and additional decorations to the ceremonial gates. And probably a squillion other matters. 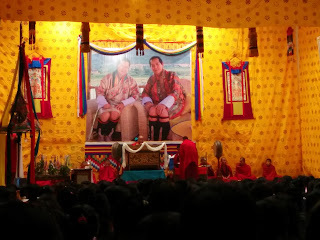 Formalities on these occasions are taken very seriously in Bhutan and staff also needed to know exactly what was required. There were also somewhat less formal occasions with important visitors, and the campfire after the formal opening, with Lyonpo Dorji Choden, was memorable. Around 700 people sat around an enormous bonfire, which had been lit with what I though was uncomfortably large quantities of volatile fluids, and there was entertainment provided - singing and dancing by the girls. Most were wearing kira and gho (the overseas teachers had not yet quite got the hang of what was required by way of dress...) The highlight of the evening, though, had to be Dasho Chitim's dancing to a Michael Jackson number. A thoroughly unlikely and incongruous sight: a gentleman of mature years, dressed in traditional gho, doing a wonderfully active disco dance as the tune, played from his phone through the sound system, echoed through the school grounds and the surrounding hills. As well as teaching English, I elected to assist with tailoring club. Club activities were conducted after lunch. As there were more than 100 girls who elected to participate in tailoring club and only 9 sewing machines, I suggested I could take small groups to teach them some useful hand stitches (ie, backstitch and blind hem) and seam construction (French seams and flat fell seams) and hand sewn buttonholes. I justified these techniques by telling them that although they were learning to machine sew, their access to machines back in their villages would be almost impossible and with these techniques they could sew their own garments. I purchased a taego piece and started to hand stitch it together, though did not get it finished before the camp ended. After afternoon tea, sport activities, including inter house sport competitions took place, followed by mass dance practice in which all girls were supposed to participate. this was coordinated by Thai dance teacher Miss Cha. After dinner the evening program included inter-house cultural and quiz type competitions as well as the occasional movie, or concert evenings with girls electing to perform songs or dances – something that many are quite confident to do. Around the time that the girls were separated into houses, Anna and I were co-opted into Sernya house and requested by the house coordinator to create a banner of some sort (without anyone else knowing). 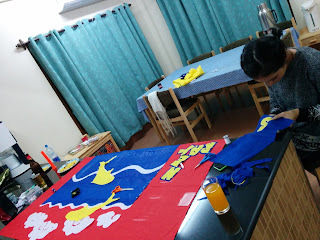 The concept evolved, as Anna and I discussed it, from poster paper based, to paint on fabric to a small work of art in fabric only. Anna, with her artistic abilities designed and cut, and I stitched (also assisted by Anna) over a number of free afternoons at the beginning of camp and after excusing ourselves for a few evenings to return to our accommodation to work on our “secret project”. It was during this time we discovered a lot in common despite our differences, and it was a rewarding project as we created our awesome piece of artwork! I was a little uncertain about sharing a room for 3 weeks, but it worked out well. Despite our different approaches to a lot of things, a bit of tolerance and consideration goes a long way, as well as being upfront about any potential issues. 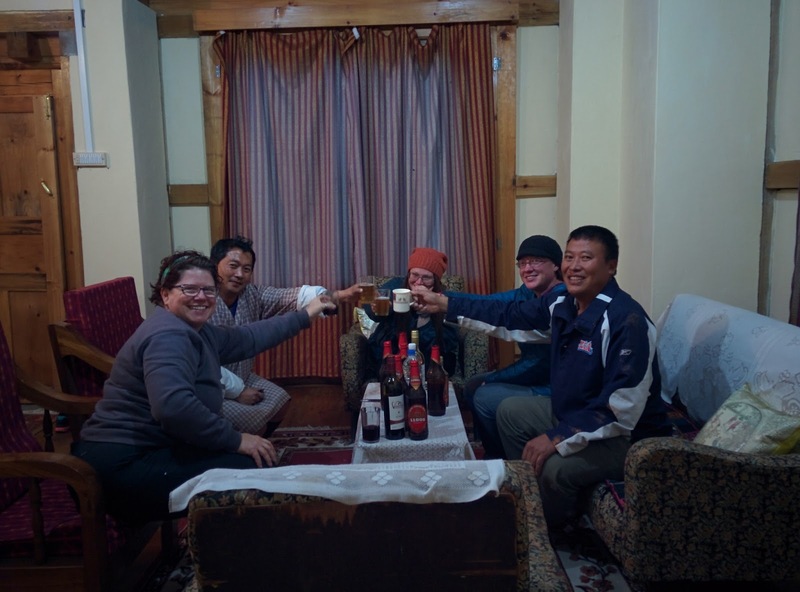 The luxuries of our room did not pall, but only seemed to expand as our delightful host, the man in charge, Sangay, seemed not to be able to do enough to oblige us. Laundry needs doing? Just leave it out. You would like to eat dinner here? What would you like? You need a lift somewhere? Just tell me, if I am not busy I will take you. Would you like a drink and some snacks this evening? Here, share these. You would like me to organise transport for you to another town? No problems. You want to stay for 2 extra nights after camp? No problem and no charge since you have been volunteering. He was so wonderfully obliging and a fabulous example of the kindness that is Bhutanese people. Roommate Anna attempting yet again to sort her suitcase! The girls were wonderful, very shy to begin with but by the end of the 3 weeks, many were very comfortable with us – at least with the overseas teachers. I had told my classes that there was not time to be shy, to be reluctant to volunteer, to take ages to get to know me and each other, they needed to do it right from the start to get the most out of camp. I had them shouting at the start of each lesson “I am confident” “I can do anything” and 2 weeks into camp, I was running a lesson and asking each girl in turn to read a sentence and realised that each was doing it straight away, clearly and with no hesitation or prevarication. That did not happen on day 1 when most were reluctant to speak aloud and I told them how pleased with them and proud of them I was. There was a visit by a TV crew during one of the last lessons, and we had about 10 minutes notice of this. I told the class what was about to happen, and once it registered that it would be the filming of a normal lesson, they begged me to make the questions easy. Of course, we did a rehearsal of the questions I would ask, so the TV crew filmed a segment with the whole class responding in chorus to my questions. Not exactly modern teaching strategies, but the girls were comfortable with this and in some ways I think I reinforced their understanding of what they were supposed to be learning – how to structure paragraphs in an expository essay. Out of class interactions improved really quickly too, from only one or two who were prepared to engage in casual conversation, many more became confident to do so, and the photography sessions also helped this. So many wanted snaps taken of themselves with one or other of the teachers. And then there was the building of “extended families”. Mine started with a rather heart rending, written request from a class 8 girl who I did not even teach, Chimi, asking if I would be her mother. She did actually have a mother, but her mother had a new partner and cared little for the girl and spent much of her time drinking. “I don’t want anything, I need your love and care”. This was followed by a verbal request from another girl, Sangay, that I would be her mom. Her mother had “got a new stepfather” (ie partner) while the girl was at boarding school, had become pregnant with twins, and the new partner had disappeared from the scene. Sangay was feeling quite neglected and uncomfortable to have come home from boarding school to have this situation foisted upon her. 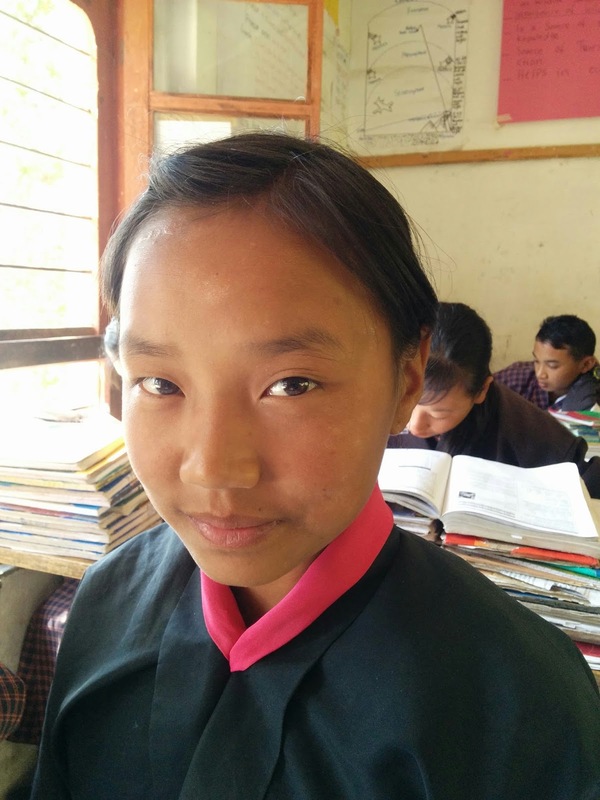 I met Sangay later in Mongar town, she was the attending relative while her mother was hospitalized prior to the imminent birth of the babies. 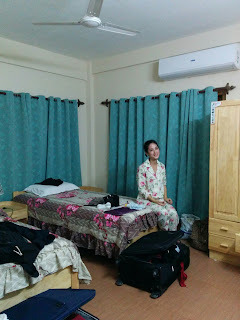 Sangay was sleeping at the hospital (ie, sharing the bed with her mother or on the upright chair beside the bed) and had only the clothes in which she was standing. She admitted to having cold feet (she was wearing only plastic sandals, so I took her to my hotel to find her some warm socks and she also admitted to being generally cold, so I gave her a long sleeved t-shirt to add a little extra warmth. She declined my offer to buy her lunch but accepted a hot cup of tea, and cake to take back to the hospital to share with her mother. She had taken me to the hospital and introduced me to her mother, (and several other relatives who were attending the hospital for their own reasons) then shown me the maternity ward rooms – the “waiting” ward, the early stage labour ward, the surgical ward for caesarian birth, the post-op ward and the neonatal ward for normal deliveries. I also had a request from another delightful girl, Kinzang, to ask fellow teacher Alex to be her brother. I insisted that this request needed to come from her directly to Alex but Kinzang was so painfully shy about this that I ended up ordering her, as her teacher, to stay back after class, to accompany me to Alex’s classroom and to ask her question. She was ready to run away but would not defy her teacher! I’d worded Alex up about this and he was more than happy and was most gentle with her while she stood in front of him, scarcely able to get a word out. She was so happy when he said yes and next day she asked if I would be her sister. So I guess that makes Alex my brother! After the camp was over, one of the local girls, Rinchen, offered to come walking with me, and told me a little about her dysfunctional family situation, then told me that she considered me not only her teacher but also her mother and her sister. I have subsequently had messages and phone calls (often missed calls, which are a signal for me to call back) from not only these girls but also others from camp and students from Kheni. It gets a little confusing for me when they use a variety of phones to send messages and don’t identify themselves but it is delightful to hear from them. The girls at camp are all from extremely poor backgrounds. 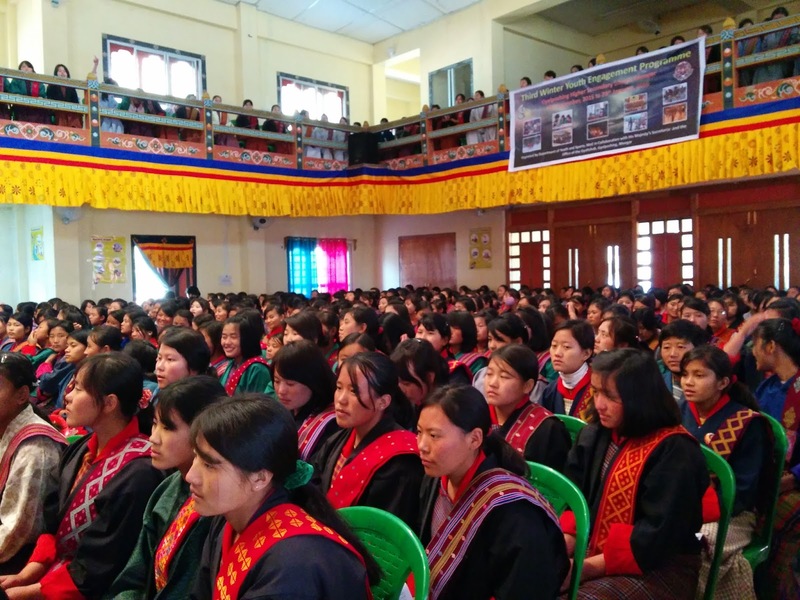 The camp was instigated by His Majesty the King, the fifth Druk Gyelpo, who was concerned when he saw girls in the east working at the roadside, breaking rocks for road construction, during the winter holidays. 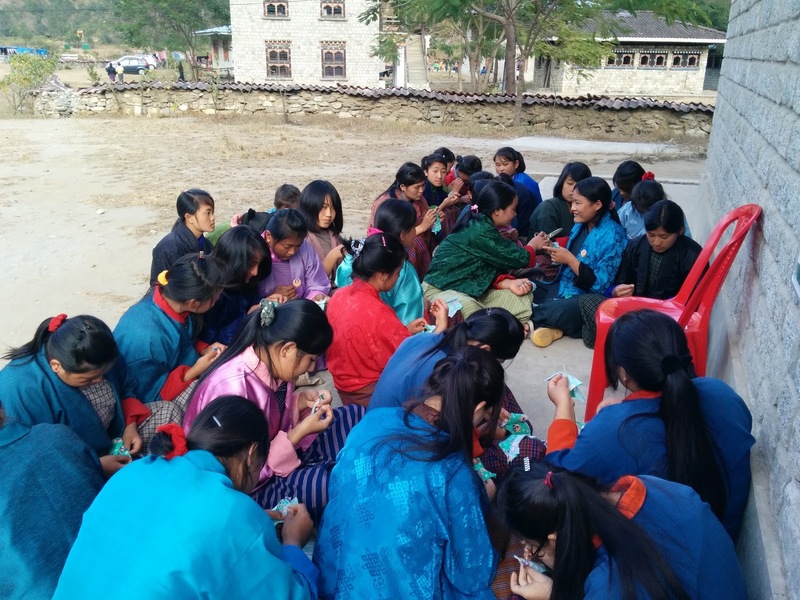 The camp aims to keep these girls off the roadworks (the girls get paid to attend camp) and give them some additional language skills and build confidence and self esteem and give them skills to deal with some of the issues they face in their lives back home. It is an attempt to avoid the exploitation (in all its forms) of these girls. Some statistics collected by the councilors showed that around 30% have divorced parents (not in itself necessarily problematic, but in rural Bhutan when families rely on farming or manual labour for their income, this often results in further economic distress), around 13% are orphans, 44% have witnessed domestic violence at home and 37% have alcoholic parents. That some of the girls are from situations that are dire was only reinforced by the fact that four were not sent home at the end of camp. They were kept back, with their consent, to be kept in the care of the Gyelshab’s office staff until school resumes and they return as boarders. I could only think that agreeing to this was possibly one of the biggest and bravest decisions these girls would ever make. The speed with which we built strong relationships with many of these girls is no doubt a result of their need as well as the atmosphere of camp. It was difficult to say goodbye at the end of the camp. In one of my formal English lessons I asked the girls to identify something that they thought was a serious issue (we brainstormed and came up with issues such as global warming, littering, poor water supply, poor water quality…) and after discussing and demonstrating the format of a formal letter, I asked them to write to someone in authority requesting specific action to deal with an issue. One girl chose to write to her school principal to ask him to deal with the issue of boys teasing and touching girls. This was something that I thought needed dealing with, so asked the writer if she was happy for me to discuss the issue in class, without mentioning her name. She was happy, not only with that, but also with filling me in with further detail of the issues at her school. So the morning’s lesson plan was rapidly amended. I started by introducing the reason (the letter to the principal about boys touching), and giving them a gentle assertive communication structure for a situation where someone might be getting too close and causing discomfort without realizing it. We went through repeating the communication and the stages of ramping up the communication to demands for the action to stop, yelling for help and even screaming. We tried some role plays, with different degrees of success. I then asked one girl to come out and put her hands on my shoulders, assuring her that no-one was about to get embarrassed or injured in what followed, and demonstrated knee to groin as a response to a boy that would not let go despite the verbal communications. It brought the house down! I emphasized that it was for “emergency use” and would give them enough time to run away and find help. I also emaphasised the message that no male has the right to do anything to them that they are uncomfortable with. Their subsequent writing suggested that for a few of them at least, the lesson had given them a degree of empowerment. I can only hope. It was lovely, both during camp and towards the end of camp, to receive the acknowledgements and appreciation of the girls, the organizers and those higher up. Some of the girls wrote letters, expressed their appreciation verbally or gave gifts. The most touching of the gifts would have to be a hand knitted “muffler” (neck warmer) and pair of baby booties for my (as yet non-existent) granddaughter. I promised to keep the latter carefully stored ready for the event. We also received some delightful official gifts in recognition of our efforts: hand paintings on fabric, books and commemorative coins and from the camp coordinators, a wonderful gift of the locally handmade wooden containers for ara. The verbal thanks from our important visitors, political and royal, was also lovely. 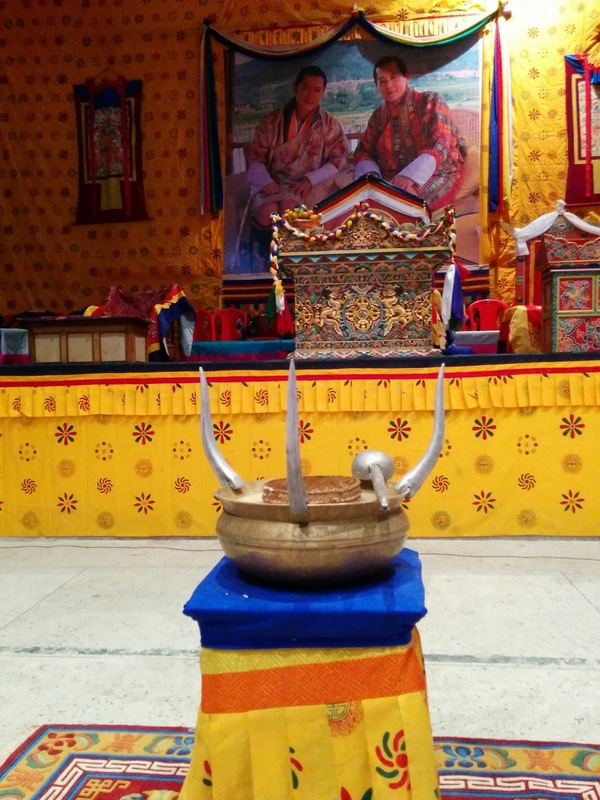 Its easy to give much by way of effort and time when one is appreciated and showing appreciation is something that Bhutanese people seem to be so good at. 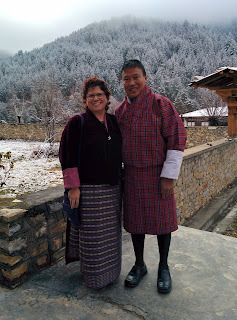 Our arrival in Gyelposhing was a wonderfully Bhutanese experience. Noone was quite sure where to go and the camp director was not there. He did have a legitimate reason – he was getting a puncture fixed. So we waited. There was also some explanation also of our rooms not being quite ready – furniture was still being delivered. 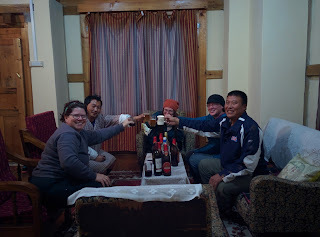 Eventually the camp director, Karma, turned up and we were taken to our rooms. It was explained that the six of us were not together; Ashley and Mike, Dan and Alex would be in one guest house – a new one and Anna and I would be in another “nicer” one. My expectations about our accommodation could perhaps be best described by the bag I had packed to go directly to Gyelposhing from Kheni – it contained a pillow, sheet, down quilt, emergency lantern, coffee plunger, sugar, milk and coffee, porridge oats, a polythene carpet, towel, plastic wash basin and a few other items. We had been told guest house, my school principal had suggested we might be sleeping on the floor of classrooms…. So our delight upon seeing the accommodation provided to the others was absolute: beds with new, clean mattresses and bed linen; one room with an ensuite with and hot water cylinder and western toilet and a separate bathroom with a squat toilet and hot water cylinder (which turned out not to work) and a small kitchenette to which was immediately added a water boiler and tea and coffee making requirements, and small, sparsely furnished living area. 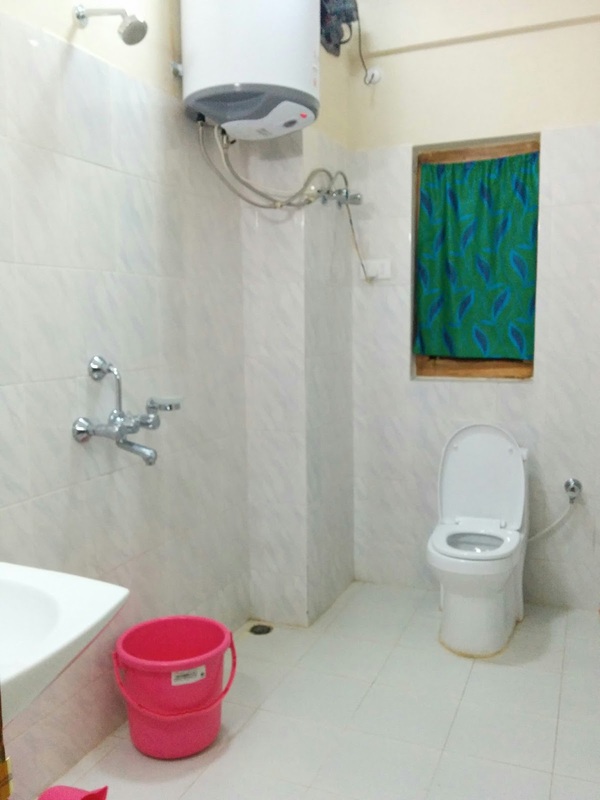 We admired these amenities, with Anna and I thinking about the promise that our accommodation would be nicer. And it was. We had a room at the guest house belonging to the Hydro Electric Project. By Australian standards, it probably was about 3 star. Compared to my expectations and my accommodation in Kheni, it was unheard of luxury. A new wardrobe and dressing table. Flat screen TV (though I don’t think we turned it on) nice beds with clean linen, towels (well, one to start with – although it did not seem thoroughly clean, and a second one materialized soon after). 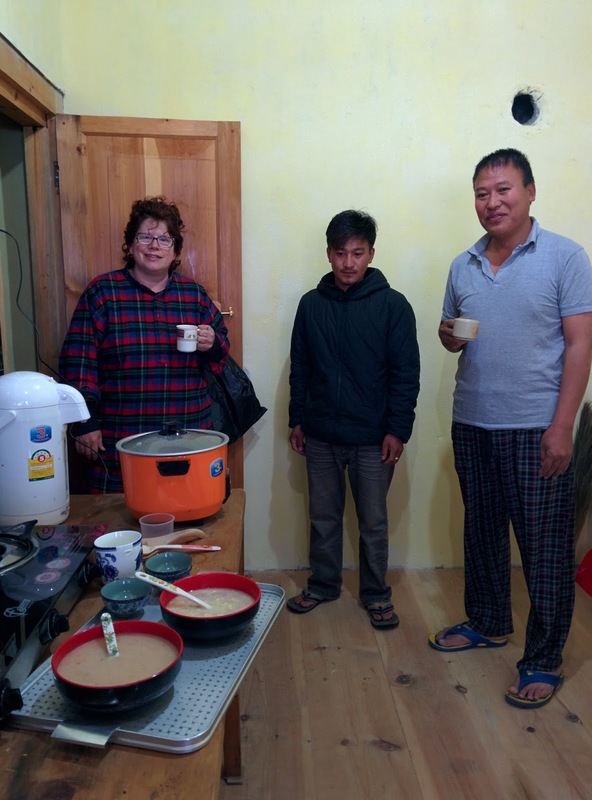 A brand new water boiler and the necessities for making tea and coffee were brought to us. Our bathroom was tiled white with a western toilet, a fixed shower and we had hot water to both the shower and the basin. There was a very large bucket and plastic jug, should we prefer a mandi bath, and this proved very useful for washing clothes. We had access to the shared sitting room, which again had a flat screen TV, and VERY comfortable chairs and couches. We were a bit worried that the caretaker was a bit uncertain about how long we were staying, and suggested that we might have to move elsewhere if too many important guests turned up, but fortunately the moving did not eventuate, although the important guests did – there was the upstairs for them. It was the start of an interesting 3 weeks. There have been so many goodbyes as my year in Bhutan has come towards its end, and all have been very difficult and much more emotional that I could have anticipated. I would never have thought that I would make such strong emotional connections in such a relatively short period of time. Though, saying that, I knew from my previous visit to Bhutan that there is something about the country that works its way into one’s psyche. Maybe sometime I might try and elaborate on that…. 7B class captain, Namgang Dorji. In summary, the goodbyes consisted of an attempt to say a few words to my home class on the last morning of classes before exams; another gathering, at student request, of some of my home class once exams were finished; the formal farewell bonfire for class 8 leavers; my formal farewell from school; result declaration day; individual visits; farewell dinners with my best friends and neighbour; the final distribution of unsold goods to my kidu boys; leaving Kheni and saying farewell to the girls at Gyelposhing. 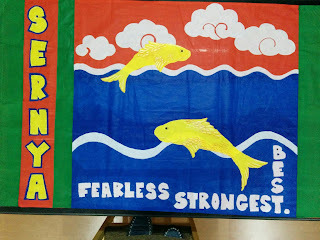 My attempt at a few words during the last session with my class 7B home class resulted in my voice breaking and tears in my eyes, which was only mirrored by many of the class – nearly all the girls and many of the boys. So many from this home group have become very dear to me. Students here write that teachers are like their second parents. For the 26 boarders in my home group, they certainly see more of their teachers than their parents. Some of them have been boarders since they were 6 year olds in class PP... and a not insignificant number are orphans who live with siblings or grandparents. I had many cards and letters from these (and other) students throughout the year and promises of never forgetting me. 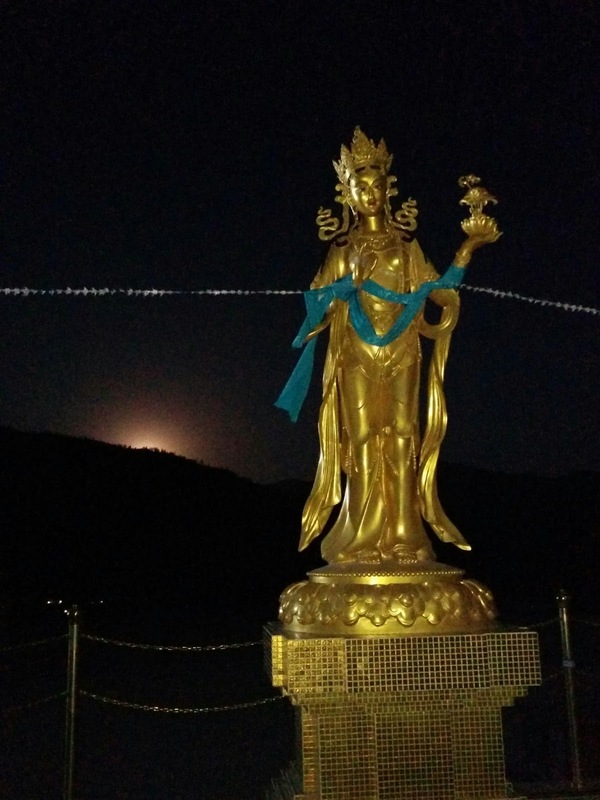 One of the most touching written communication was from Norbu, who expressed the wish that we meet again as parent/child in the next “generation” (reincarnation). Prolific thanks and gratitude were expressed in these letters, the students’ gratitude is very real and makes every effort and any hardship worthwhile. I spent some time setting up a student email account and student Skype account and enjoyed Norbu’s delight in sending and receiving his first email and having his first Skype conversation, albeit with me who was just outside the door. The next farewell was an unexpected request from my class captain, Namgang, to come and meet with the class after their exams were finished. 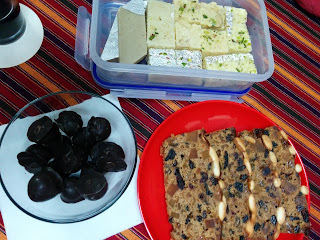 I complied and about half the class were present to give me a farewell party – juice and “chocolates” (the generic word for any sweets) and a gift for which the students had taken up a collection. Namgang and Pema had gone shopping and chosen a pair of pretty covered china mugs – a very kind thought. I assured them that these would be packed carefully for my return to Australia and I would think of them whenever I used the mugs. More tears ensued and I gave them all big hugs. I really will miss them. The formal farewell bonfire for the class 8 leavers (not all of class 8, some had not passed a sufficient number of subjects and would be held back to repeat the year) was held on the evening after the last exam and was attended by classes 7 and 8 and staff. Namgang had asked me to help him compose a speech, and I sat with him to explore some ideas and said I would check his final written speech for him, but he was told that only class 8 students would speak. This young man has such amazing leadership qualities, I really hope he is school captain for 2016.
quantity of volatile fluids, a practice that always makes me a little uneasy. The food and drink was much the same as for any school or village social occasion, with tea and biscuits followed by alcohol for the staff (discretely served in mugs to pretend it was only tea) then dinner. Dinner was followed by entertainment and words of wisdom. It would have been nice to know that staff, particularly teachers of class 8, were expected to each contribute something to the words of wisdom and I could have been better prepared and practiced to avoid emotions. My emotions did, of course, trigger a similar reaction in some of the students, and some of the teachers – even those with whom I was not particularly close. I told the students that it really had been a truly amazing year for me and gave them advice about considering carefully, in a changing world, what changes they adopted and how they integrated this into their traditional culture and practices – not everything new on offer is particularly good or desirable in the long term. To always value their own traditions and culture amid the change can be a cornerstone of sanity and strength. 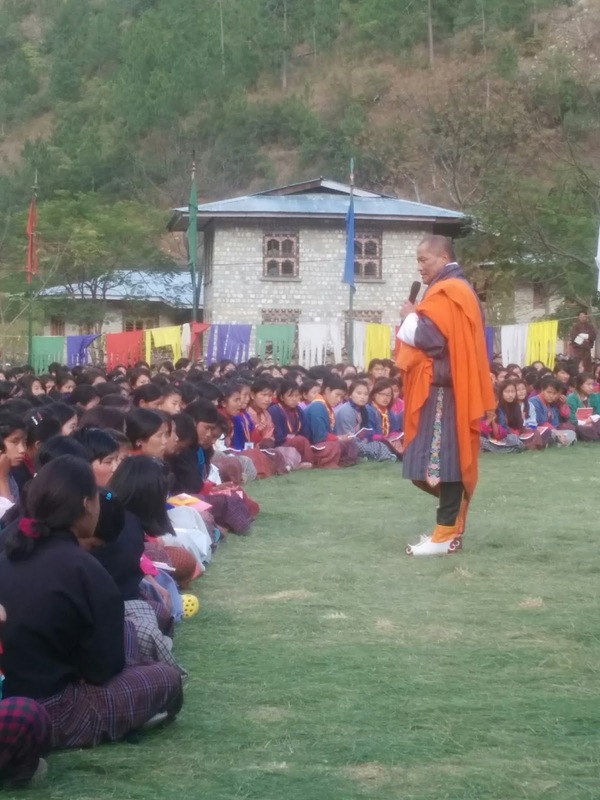 Student spoke variously in Dzonkha and English, and after the class 8 speakers, the floor was open to class 7 speakers. One of my smarter but more unlikely students gave a farewell speech (in English) which one of my colleagues kindly interpreted for me. Namgang came out to give his speech, but lacked the confidence to give an unprepared speech in English, although he speaks well publicly. He spoke in Dzonkha – with apologies to me for doing so, which was really sweet. I also wish I had been warned about the entertainment….. all staff were expected to contribute and it was with great reluctance that I took the microphone for a poor rendition of “Advance Australia Fair”. After an assortment of students performed their skits, dances and songs, the final farewell dance / song was performed – a circle dance around the campfire – something that always challenges me to get both the steps and hand movements coordinated. 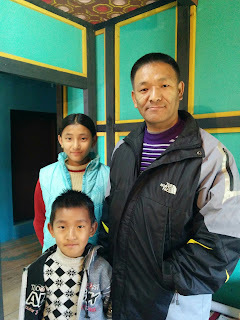 Dear little class 7 Sangay, who had invited me on excursions during the year, including visits to her grandparents’ village and homes, had asked if she could visit before I left, so of course I agreed. She came with a farewell gift of a mug and heaps of oranges, groundnuts and sugarcane and while thanking her profusely I did request that she not spend any more money on buying me gifts. Her family is very poor and have already been more than generous towards me. I asked that she visit again the day before I left Kheni, and gave her my water filter – in the hope that this might help to maintain her family’s health, particularly in the monsoon season. Thinley had also expressed a wish to see me again after exams finished, and had said he would come and visit and sleep at my house for a night or two (his village is 3 hours walk away). Not sure that I felt totally comfortable to have adolescent male students invite themselves to spend a night in my house, I told him I would check with the principal (entertaining students at home is against the staff code of conduct) and subsequently suggested we meet for a picnic lunch halfway between Kheni and his village. Note to self: when agreeing on a meeting point, it is always useful to ensure one’s knowledge of the geography of the area…. I passed the turnoff meeting point and about ¾ hour later, when I was more than half way to Jangphutse, decided that I had cone too far, made some phone calls to confirm, and turned around to come back. Thinley was not at the meeting place and it was well past the appointed time. I thought he may have gone looking for me, so sat tight and eventually someone passed who spoke English and confirmed that Thinley was indeed on the path to Kheni. Eventually Thinley returned, having run for the last couple of kilometres after he spotted me from the other side of the river, and we laughed about my lack of geographical knowledge and proceeded to a nice spot beside a stream for a picnic. I had spend the previous afternoon making samosa, more than enough to fill a 15 year old boy’s stomach and feed me, and after we had eaten a quantity of these, Thinley asked if I had brought lunch. Silly me, to assume that a Bhutanese teenage boy would consider he had eaten lunch if he had not had curry and rice. Thinley brought out his packed lunch, a particularly delicious cold curry made from hard boiled eggs chopped with onion, chilli and coriander. He had also brought delicious gifts for me of oranges, sugarcane and feijoa. My formal farewell from the school was a shared farewell with one of the retiring cooks and was held in the school multi purpose hall. Like all staff functions, we gathered more or less at an appointed time and waited until someone thought it appropriate to go inside. I was directed to sit at the head table with the retiring cook – a bit boring for both of us with little shared language and only non-verbal communications about how cold the draft from the door was. Tea and biscuits was accompanied by formal speeches and the invitation to all staff to speak – Zangmo gave a most touching speech, and then alcohol was served, followed by dinner and a most unusual departure from the norm. Disco dancing. The previous evening had been a baby shower, and the younger male members of the community had brought a sound system and dancing ensued. I had made a comment early in the evening that I would dance at my farewell if there were disco lights and hey-presto, a small revolving device was attached to one of the stage lights to provide disco ball effects! There were many expressions of surprise by Vice Principal Kencho at this departure from village norm, he had not been present the previous evening, and I did have to point out that it was not my influence. Lots of fun was had by all – more so by some than others as I observed those who seemed ready to continue their entertainment privately afterwards! The elasticity of the marriage commitment seems considerable – when the cat’s away…. 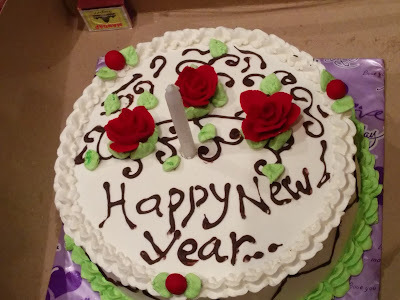 Zangmo suggested it was time to disappear around 11pm, as some were getting somewhat inebriated and we did not feel the need to be escorted home…. 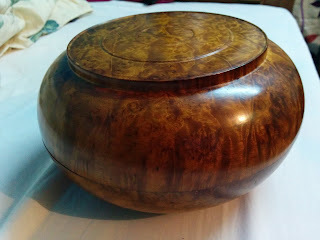 I was absolutely rapt with my gift from the school, a beautiful covered hand turned wooden bowl, a speciality of the Trashiyangtse area. A lovely memento of my time in the far east of Bhutan and at Kheni school – not that I think my memories of that will fade for a long time. 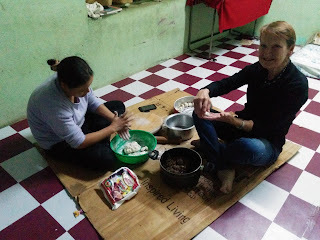 Both Phub and Zangmo had invited me to farewell dinners, and the diner with Phub was actually an impromptu one of momo making. It was a most enjoyable evening after which she gave me a farewell gift: a small and very beautiful statue of the god of health. A more formal invitation had to be cancelled as her visit to hospital in Yangtze with her sick newborn turned into an extended stay. I was so glad that we had said farewells just in case this happened. I will miss her a lot. There was also a delicious dinner with Zangmo – she makes the best ever snacks to go with drinks: crispy noodles are mixed with onion, chilli, coriander and tomato. Very morish. 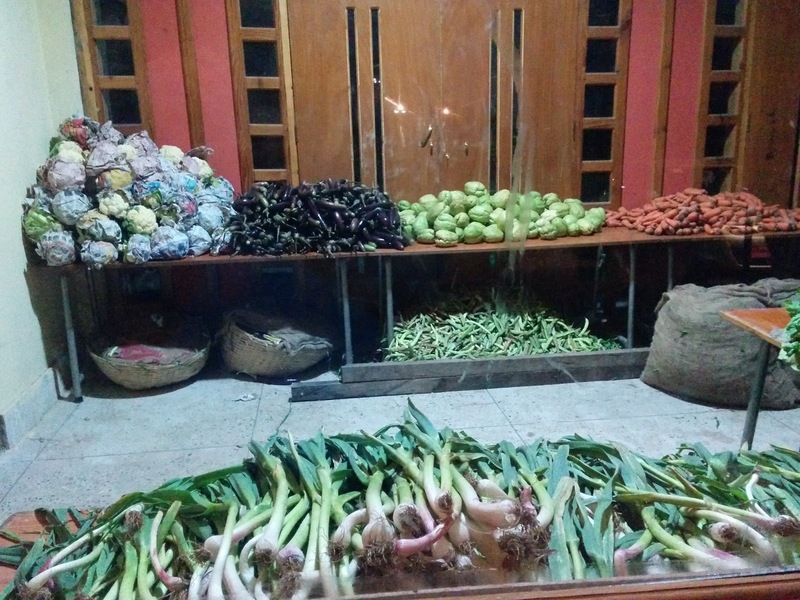 For my last night in my house, my neighbour Sithar invited me to share dinner - an invitation which also included other neighbours, and food was prepared as a communal effort by all. Very enjoyable. I don’t think I cooked dinner for myself for nearly a whole week. Results declaration was quite an odd opportunity to see the students again. I had declined an earlier departure from Kheni since I had promised the students that I would be at results declaration day on 18th December. Some students were uncertain of the date (judging by the phone calls I had from students inquiring about it) and others uncertain about the time – some arrived at school just as their name was announced for their prize! Others arrived after their position in the class was announced. Unfortunately there were also administrative duties to perform at this time: the collection of levies for lost text books, so amid this, which was conducted in a sort of controlled chaos, it was difficult to say goodbye to those students I particularly wanted to see. I did manage to catch the “toppers” for my home group and direct them to go and select themselves a reward from the bag of assorted stuff on my desk and the kidu boys to whom I wanted to give assorted household goods. Norbu had unfortunately not come to result declaration, but I gave a card to someone to deliver to him. Saying goodbye to Thinley and Nima after I had distributed my household goods to them was difficult. I have great affection for both of them and Nima is a highly gifted young man, for whom I have some concern about how the education system will accommodate his intelligence, questioning and independent thinking. After the final pack up on the morning of my departure, I went for a walk for one last look at the amazing view from the end of the road and to drop a few items at Phub’s house. As noone was home, I left the items with Sister at the BHU and said goodbye to her and her son Tenzin – one of my home group students. She encouraged him to do something about which he was hesitating: a gift of a mug – this one a coronation mug. Apparently he had wanted to do this for some time but had felt a little shy about it. He’s a capable boy, but as a second child lives in the shadow of his very academically successful brother and tends to work hard only when motivated externally by a strict father. I have tried to talk with him and ask him to think about what is going to motivate him when he goes to boarding school in class 9. Who knows how much that will give him food for thought? "Just one more hug Madam"
As I left Kheni, Zangmo came to say goodbye, as did my very kind school principal – along with his 2 children who brought me a gift of 2 shiny Nu1 coins – a response to my comments earlier in the year that I had not seen such items despite the maths text book referring to them regularly. Hugs and farewells were exchanged all round, and Zangmo’s admonitions of “don’t cry Lynne” became a bit of a catch phrase, albeit unsuccessful. I have, over the year, developed a very close relationship with her and will miss her enormously. 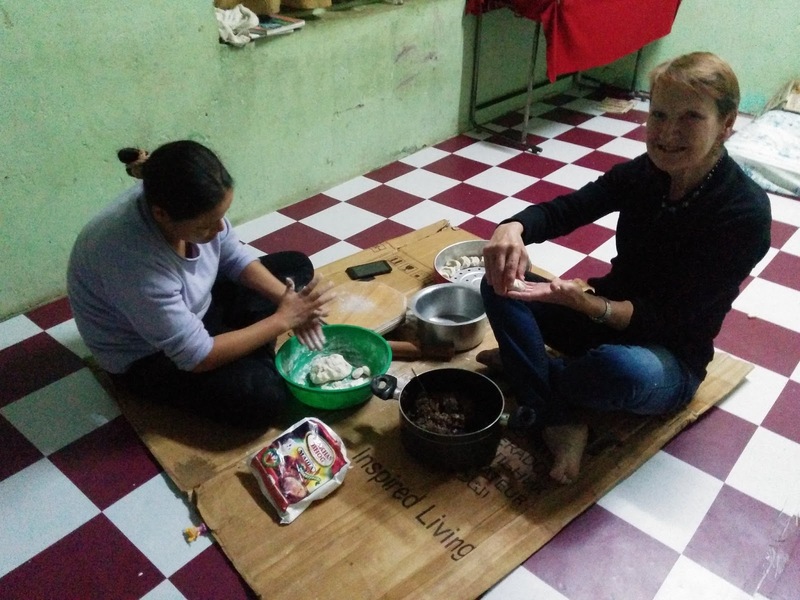 I am so lucky to have 2 ladies in the village with whom I became such good friends – subsequent discussion with other overseas teachers suggested that some women have difficulty in forming close relationships because of social structures within the villages. I had trouble controlling my emotions all the way from Kheni to Trashigang. It was a most amazing experience and probably one of the best years of my life. The final farewell with the girls from Gyelposhing was also very emotional. There were hugs and tears as girls said goodbye to each other and to the staff. My newly adopted family members were there to say their special goodbyes to me. I had thought I would be OK, but some of the Kheni girls, in particular, were very emotional in their own ways, from Lungten’s uncontrollable tears to Tendi’s stoic “one more hug, madam” and Dema’s smiling face assuring me she would never forget me. It was with a lump in my throat and tears in my eyes that I waved farewell as the Tshencarla bus bore them away back to Kheni. My reaction as I write this is not much different.